You can’t beat that feeling of putting something together yourself, standing back, and admiring your handiwork. 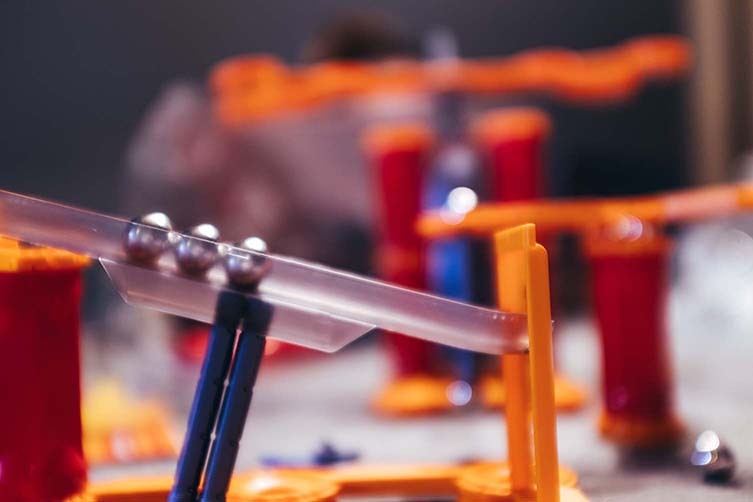 And with 243 individual pieces, Geomag’s Gravity Shoot & Catch really is something to admire; especially when the wonders of magnetism and gravity bring it to life in front of your very eyes. 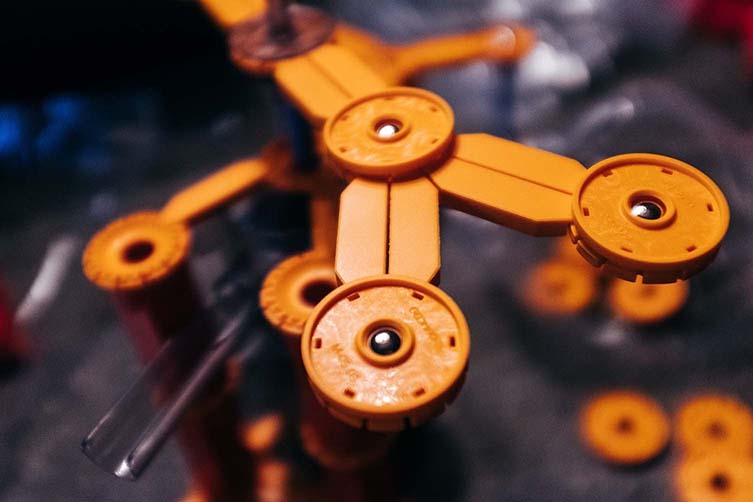 The box includes a mammoth 11 magnetic rods, 36 steel spheres, and 196 plastic pieces, although you’ll soon be absorbed by the many constructions you can create. 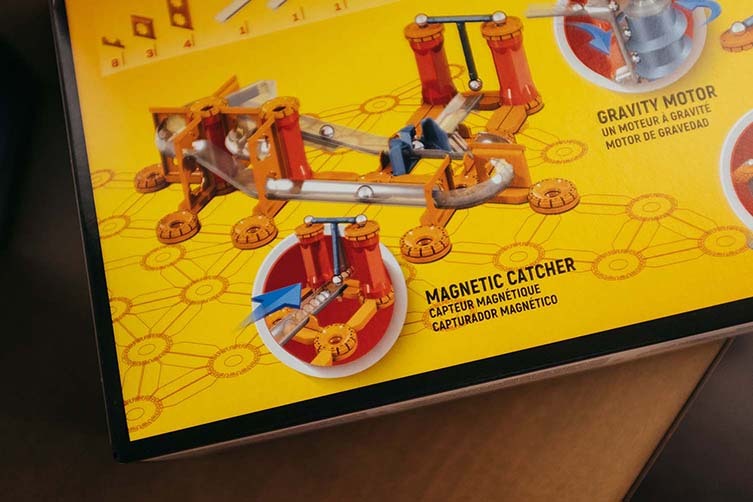 Patented in 1998, Geomag’s magnetic construction kits are a kinetic alternative to the likes of LEGO, and promote STEM (science, technology, engineering, and mathematics) learning—educational and inspiring, you needn’t be a kid to get deeply involved in putting these mini scientific wonders together. 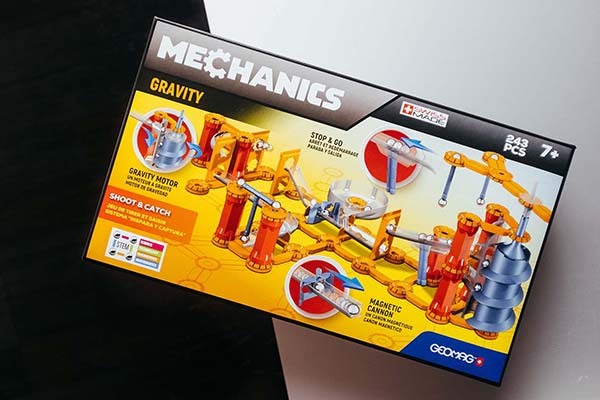 Free from electrics or battery power, the Geomag Mechanics Gravity Shoot & Catch is an expansive kit that pushes metal spheres up and down a rollercoaster of slides via a magnetic cannon and gravity motor; each element packed with practical educational experiences. 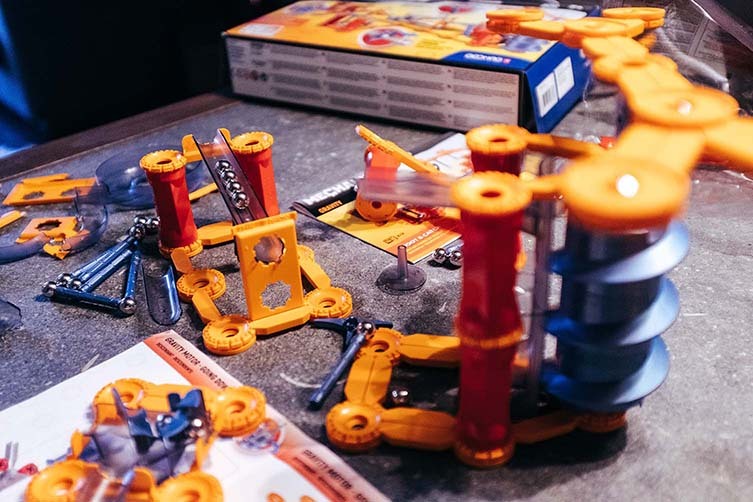 Open up the box and you’re presented with a mammoth 11 magnetic rods, 36 steel spheres, and 196 plastic pieces. 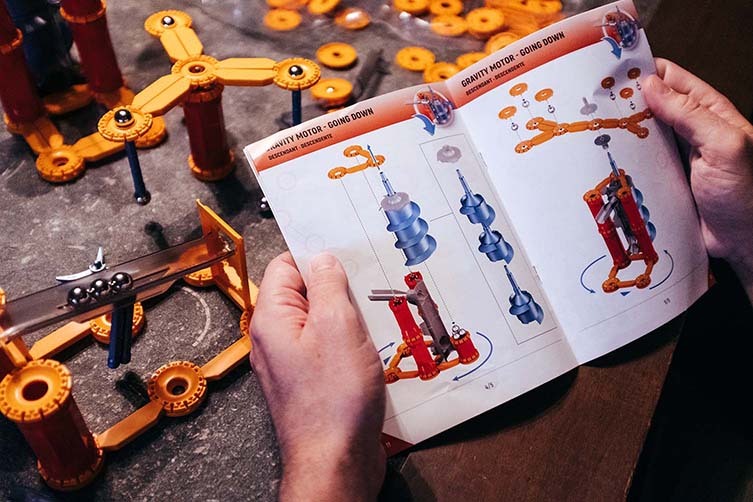 It might take a little while to get to grips with what’s what, but once you get underway with the ‘basics’ instruction manual, you’re soon absorbed by the set and the many constructions it allows you to create. 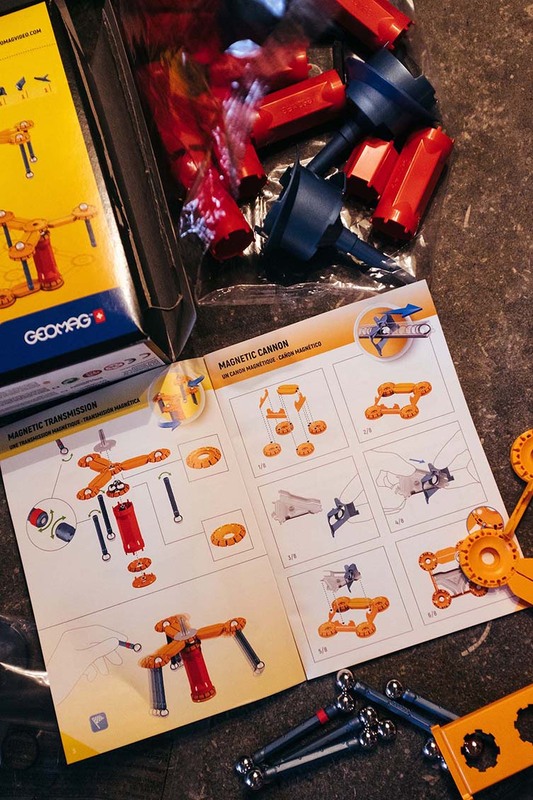 Building a magnetic transmission; magnetic cannon (which really is terrific fun); gravity motor; a stop and go slide; and magnetic catcher, the principles of the sprawling project that is to come become clearer with each build—by the time you’ve put all of these parts together you’re hooked. 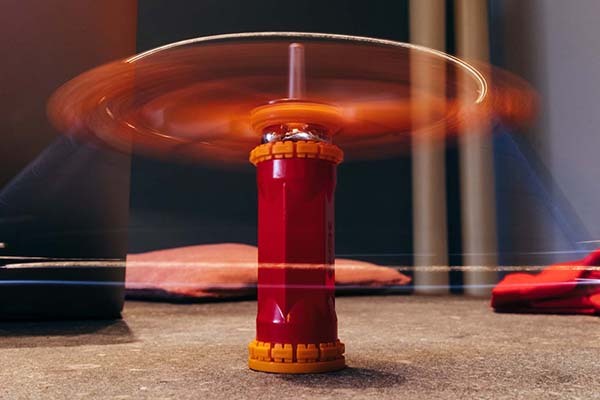 Studying gravity and magnetism shouldn’t be this much fun. There’s something intensely satisfying about composing piece after piece before the wonders of magnetism and gravity bring it to life in front of your very eyes. The simple satisfaction of spending time composing piece after piece and then watching it come to life cannot be overstated—especially so in a time when so much of our lives is spent in a virtual realm. 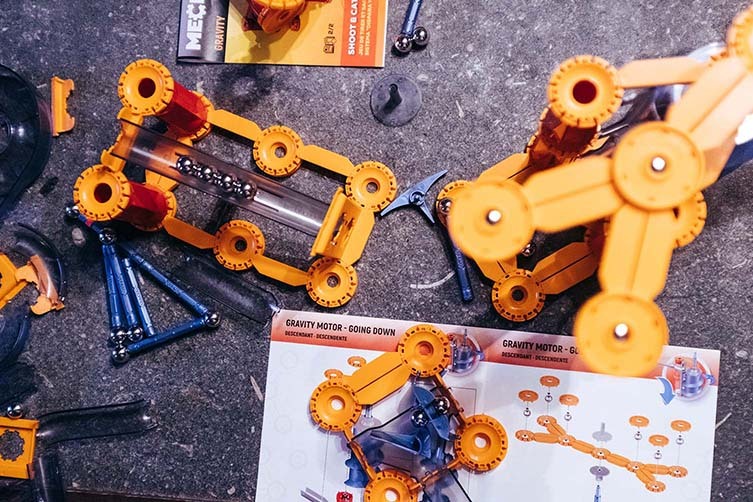 Getting physical with working objects is considerably more rewarding than the latest smartphone game with heroin-levels of addictiveness built in. 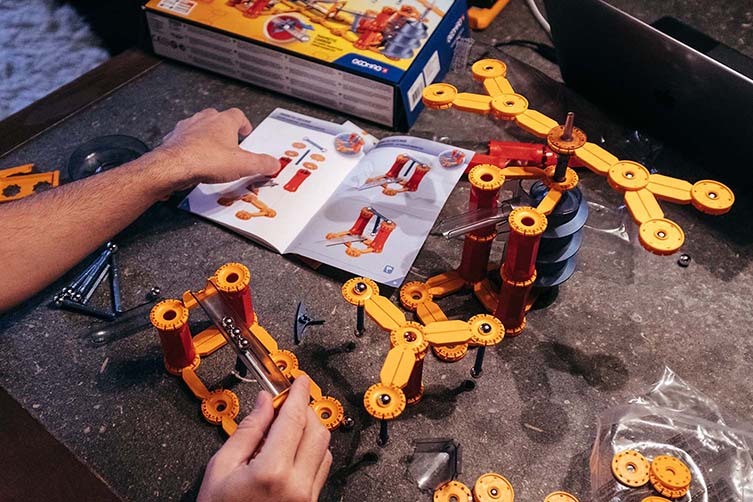 As mindfulness and meditation are creeping into the mainstream, there is a very real therapeutic aspect in putting together projects like this—it’s easy in the digital world to lose the sort of skills involved in puzzles like these (patience being a particular loss to humanity), and rediscovering your inner child can be an intensely enriching experience. All together, the various components that comprise the Geomag Mechanics Gravity Shoot & Catch kit work like one of those elaborate old domino effect demonstrations—the steel spheres rolling around, stopping before being fired off again, up a gravity motor and caught by swinging magnetic … it’s transfixing stuff, and a fine way to relieve a stressful week at work. 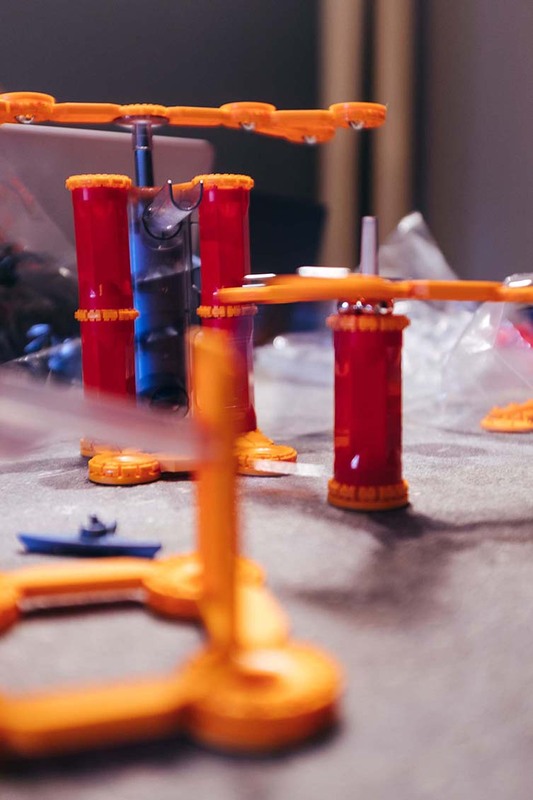 If you want to challenge yourself—or know a youngster in need of a practical challenge—then now’s the time to listen: follow and like Geomag’s Facebook page, leave us a comment at the footer of this page, and you could be the lucky winner of a Geomag Mechanics Shoot & Catch set. We’ll pick a winner randomly after 5pm GMT, Friday 7 December.